Rubus thyrsanthus , (Focke) Foerster. Rubus grabowskii , Weihe ex Gunther et al. Rubus discolor is a perennial species of blackberry that forms large impenetrable thickets of prickly canes. Thickets can become so dense that native species diversity is reduced through shading out and inaccessibility. Thorny stems block access of humans, livestock, equipment and vehicles to pastures and waterways, and leaf litter accumulations within thickets, creating potential fire hazards. Rubus discolor is a strong perennial bramble, with stems that can sometimes reach 3m in height. Other stems are decumbent, trailing or scandent up to 6-12m long with straight or somewhat curved prickles 6-10mm long. Leaves are mostly 5-foliolate, bright green, glabrous above when mature and cano-pubescent to cano-tomentose beneath. There are hooked prickles on the petioles and petiolules. The leaflets are large and broad with the terminal leaflet roundish to broad oblong. Leaflets are abruptly narrowed at the apex, unequally and coarsely serrate-dentate. The inflorescence is a large terminal cluster with branches in the lower axils. Flowers are white to rose and up to 2-2.5cm across and have broad petals. Sepals are broad, cano-tomentose, conspicuously pointed and soon reflexed, approximately 7-8mm long. The fruits mature from red to shiny black and succulent (Alaska Natural Heritage Program, 2005; and Hoshovsky, 1989). Rubus discolor is capable of clonal growth as well as sexual reproduction and has perennial roots that may simultaneously bear several biennial canes. During the first year, a cane remains entirely vegetative and growth is limited to elongation of the cane. In the spring of the second year, lateral shoots develop from buds in the leaf axils and the first-year leaves senesce. Growth during the second year is limited to lateral shoot elongation. Inflorescences are borne in the axils of leaves and at the terminal apex of each lateral shoot. R. discolor can form roots at cane apices. Daughter plants develop where these canes root. Canes produce berries in their second year and then die. Re-entry of canes into the center of the thicket result in an impenetrable mass of prickly canes. Individual canes may only live 2-3 years, yet reach a density of 525 canes per square metre. R. discolor can also readily propagate from root pieces and cane cuttings (Hoshovsky, 1989; McDowell and Turner, 2002). Rubus discolor provides food and cover for many wildlife species. Fruits are eaten by numerous birds. Mammals such as the coyote, red fox, squirrels, and black bear, also feed on R. discolor. Deer, elk, beaver, porcupines, and rabbits consume the buds, stems, and leaves of R. discolor (Alaska Natural Heritage Program, 2005). Rubus discolor readily colonizes disturbed and neglected areas. It forms impenetrable thickets in wastelands, pastures, shrublands and forest plantations. Seedlings require open habitats or eroded soils for germination and establishment. It grows along roadsides, creek gullies, river flats, fence lines, open ridgetops and is common in riparian areas and right-of-way corridors. R. discolor tends to prefer wet sites even in relatively wet climates with an average annual rainfall greater than 76cms (30 inches) and appears to be able to tolerate flooding. R. discolor can grow well in infertile soils. It tolerates a wide range of soil pH and texture, (Alaska Natural Heritage Program, 2005; and Hoshovsky, 1989). Rubus discolor reproduces by seed, rooting at cane apices, suckering of lateral roots, and from root and cane fragments. Thickets can produce up to 7,000 to 13,000 seeds per square metre. Seeds viability is retained for several years in the soil. Each R. discolor seed contains two ovules, but one usually aborts. The seeds are contained in berries, which consist of a number of loosely adhering drupelets. Berries ripen and turn black during the summer on canes more than one year old. R. discolor thickets themselves are poor sites for seedling development. The establishment of R. discolor seedlings depends on the availability of open habitats such as land neglected after cultivation, degraded pastures, areas rooted by feral pigs and eroded soils along streams. Mammals and birds readily disperse seeds. Passing through digestive tracts appears to scarify seeds and may enhance germination. It can be spread considerable distances by streams and rivers. Omnivorous mammals such as foxes may also accomplish dispersal (Alaska Natural Heritage Program, 2005; and Hoshovsky, 1989). R. discolor probably was introduced to North America in 1885 as a cultivated crop (Alaska Natural Heritage Program, 2005).Humans transported R. discolor long distances for use as an ornamental (Starr et al. 2003). Review: Hank Oppenheimer, Research Corporation University of Hawai`i. Recommended citation: Global Invasive Species Database (2019) Species profile: Rubus discolor. Downloaded from http://www.iucngisd.org/gisd/species.php?sc=994 on 21-04-2019. Rubus discolor colonizes areas initially disturbed and then neglected by humans. It then forms large impenetrable thickets of prickly canes with densities reaching 525 canes per square metre. A large quantity of litter develops in mature thickets. The thickets create dense shade, reducing native species diversity and likely limiting mammal movement in gaining access to water. In addition, the tangled mass of thorny stems blocks access of humans, livestock, equipment, and vehicles to pastures and waterways. These dense thickets and litter buildup represent potential fire hazards (Alaska Natural Heritage Program, 2005; and Hoshovsky, 1989). It has the potential to hybridize with native species of Rubus (Oppenheimer pers.comm., 2006). R. discolor is a perennial weed which is difficult to control due to its ability to regenerate from sections of root stock. In forest areas, timber-logging operations create large open areas that are often invaded by R. discolor. When grazed, the thorny stems can injure nasal passages of livestock. Another undesirable aspect of R. discolor is that they are a good source of food and shelter for rats (DiTomaso, 2006; and Hoshovsky, 1989). Rubus discolor is a difficult species to control because of its extensive vegetative reproduction and because it often grows in very sensitive wetland habitats. This species is shade-intolerant, so planting fast-growing shrubs or trees may prevent reestablishment. Resprouting is problematic, and many years of follow-up efforts are necessary for control. Plants can be eliminated by grubbing with follow-up treatment a year later, repeated mowing, and by pasturing with goats. Goats eat blackberries readily, and seem to prefer them to other plants. An economic analysis in Australia showed that running goats on a blackberry-infested pasture was cheaper than using herbicides to manage the berries. (Alaska Natural Heritage Program, 2005; Cox, 2003; and Francis, UNDATED). Chemical: Research has shown that the herbicides picloram, 2,4,5 T, and a combination of aminotriazole & ammonium thiocyanate are effective at controlling R. discolor (Amor, R.L., 1972). Fechtig and Furtick (1964) assesed the efficacy of various herbicides on R. discolor and found that only picloram at rates 2 lb./acre gave complete control of R. discolor on assessment 5 months after treatment. Lower rates of picloram (1 lb./acre) gave 95 % control, while 2,4,5 T at 1, 2 and 4 lb./acre gave respectively 75, 85 and 93 % control. Foliar application of Trichlopyr amine at 2% effective, as is cut stump af Trichlopyr amine at 100%, especially as primocanes emerge (Oppenheimer pers.comm., 2006). Biological: A highly virulent strain of Phragmidium violaceum (bramble leaf rust) from central France has shown to offer some evidence of specificity; being effective on R. discolor. The infection weakens growth and reduces the rate of spread of the weed, making it more manageable. 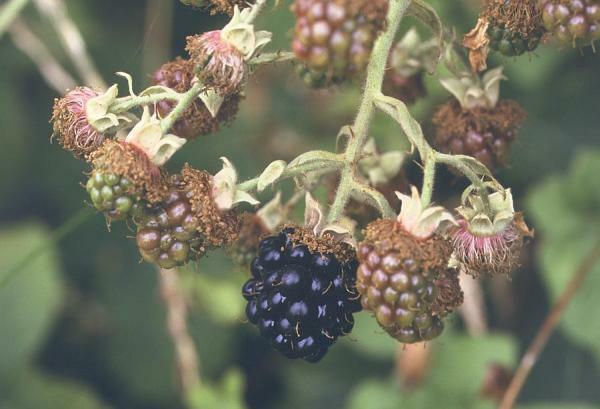 The State of Victoria in Australia has investigated and approved blackberry as a candidate for biological control by Phragmidium violaceum. Unfortunately results so far show the program as being unsuccessful because the rust has not caused significant damage to its host. In the United States, the introduction of herbivorous insects and fungi to control R. discolor is not supported by USDA because of the risk posed to commercially important Rubus species (Alaska Natural Heritage Program, 2005; DiTomaso, 2006; Dodd and Lloyd, 1992; and Parsons et al. 1984). 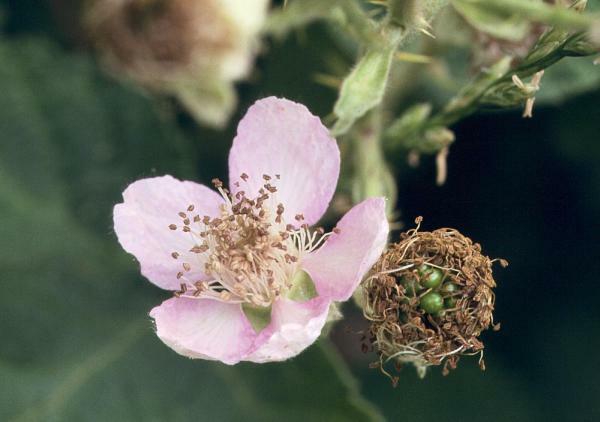 Biological control in Hawai`I should be discouraged without rigorous testing because of 2 endemic Rubus spp. (R. hawaiiensis, and R. macraei), the latter restricted to high elevations on East Maui and Hawai`i Islands, and considered rare (Oppenheimer pers.comm., 2006). Informations on Rubus discolor has been recorded for the following locations. Click on the name for additional informations. Alaska Natural Heritage Program. 2005. Himalayan blackberry - Rubus discolor Weihe & Nees. Environment and Natural Resources Institute: University of Alaska Anchorage. Collins, J.N, May M, Grosso C. 2003. Himalayan blackberry Rubus discolor. Practical Guidebook to the Control of Invasive Aquatic and Wetland Plants of the San Francisco Bay - Delta Region. Available from: http://legacy.sfei.org/nis/blackberry.html [Accessed 22 May 2010]. Hoshovsky, M. 1989. Element Stewardship Abstract for Rubus discolor, (Rubus procerus). The Nature Conservancy. Amor, R. L. 1972. A study of the ecology and control of blackberry (Rubus fruticosus L. agg.). Journal of the Australian Institute of Agricultural Science. 1972, 38: 4, 294. Cox, C. 2003. Nonchemical methods for removing unwanted blackberry plants. Journal of Pesticide Reform 23(1):10-11. Cullington, J. 2002. Annotated Bibliography on the Ecology and Management of Invasive Species: Himilayan blackberry (Rubus discolor, R. procerus). Garry Oak Ecosystems Recovery Team and the Nature Conservancy of Canada. DiTomaso, J, M. 2006. Wild Blackberries. University of California Statewide Integrated Pest Management Program (UC ANR Publication 7434). Dodd, J., and S. Lloyd. 1992. New leaf rust helps to control blackberry. Journal of Agriculture, Western Australia 1992, 33: 2, 47 50; 4 ref. Fechtig, A. D., and W. R. Furtick. 1964. Control of giant Himalaya Blackberry (Rubus procerus P. J. Muell.) with organic chemical compounds. Weed Abstr. 14 (4):1163. Francis, J. K. UNDATED. Rubus discolor Weihe & Nees Himalayan blackberry. Department of Agriculture, Forest Service, International Institute of Tropical Forestry. McDowell, S. C. L., and D. P. Turney. 2002. 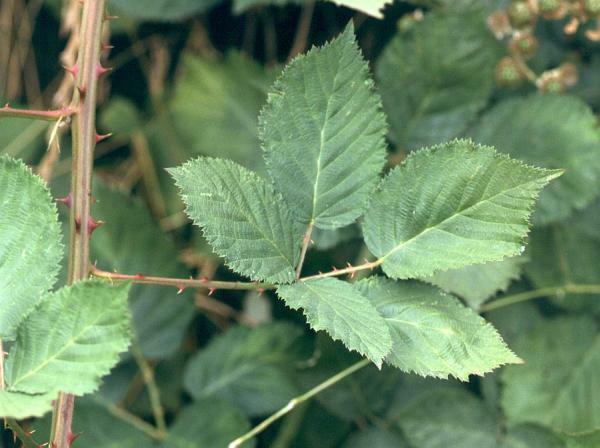 Reproductive effort in invasive and non-invasive Rubus. Oecologia (2002) 133:102-111. Parsons, W.T., R.P. Field, E. Bruzzese and R.W. Madin. 1984. A research project with an unexpected development. Proceedings of the seventh Australian weeds conference, 1984, Volume I. 1984, 121 124. Starr, F., K. Starr, and L. Loope. 2003. Rubus discolor Himalayan blackberry. United States Geological Survey--Biological Resources Division: Haleakala Field Station, Maui, Hawai i.
Wagner, W. L., D. R. Herbst, & S. H. Sohmer. Manual of the flowering plants of Hawai`i. Volume 2, p 1106. Bishop Museum press, University of Hawai`i press, Honolulu. Research Corporation University of Hawai`i.